NOTE: COMPRESSION RATIO’S LISTED ARE FOR COMPARISON PURPOSES ONLY, ACTUAL RATIO ACHIEVED MAY VARY DEPENDING ON APPLICATION. HKS metal head gaskets are engineered to resist severe levels of heat that are generated by high-horsepower and high-boost applications. 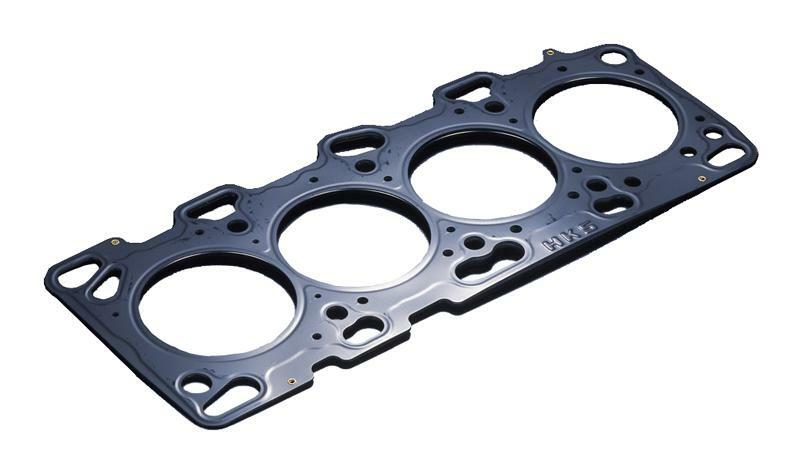 All HKS head gaskets are constructed with multiple layers of steel and coated with a special fluorine rubber to provide exceptional sealing. HKS head gaskets are designed to accommodate standard and certain oversized cylinder bores. The HKS Stopper-Type gasket consists of the maximum layers of plates possible and utilizes a molded stopper ring around each combustion chamber opening. The HKS Bead-Type gasket features a raised bead structure around each combustion chamber to ensure a precise seal. The HKS Grommet-Type Gasket employs a metal grommet around each combustion chamber, to ensure an excellent seal between the cylinder head and the engine block.